WARM RECEPTION: "On the rocks?" is a question you’ll never hear in Scotland. Scots don’t hate ice—they hate that it takes up space in their glass. It was raining as if it might forget to stop, a soaker so Homeric that even the puddles complained of feeling damp. Not a single soul that comprised the Honourable Company was to be seen on the links. Muirfield would have to wait, so the two Americans and a friendly Scot of no little renown in Gullane ducked into the silent bar at the Greywalls Hotel. Acquaintance being made with the Americans just that very morning, the Scotsman was understandably unaware that the two rotundities, both in Scotland for the first time, were professionals. You should try Belhaven, a Scottish beer, my throw, said he. We should, said we. Barman, he said, without a hint of hesitation, a bottle of Belhaven, and three glasses. It occurred to us that perhaps the Scots might be cheap. If it’s not too much trouble, please get in your car and drive to Hopedale, a small town in Newfoundland and Labrador. Welcome to Canada. You are at roughly the same longitude as Edinburgh. Face north, and look to your right. Now, look farther. Farther. Farther, damn you! It’s coming into focus and—voila!—the Scotland of single malts as imagined by Americans. Permanent golden-hour daylight, bagpipes honking at an agreeable decibel level, distillery workers (cloaked in secrecy!) 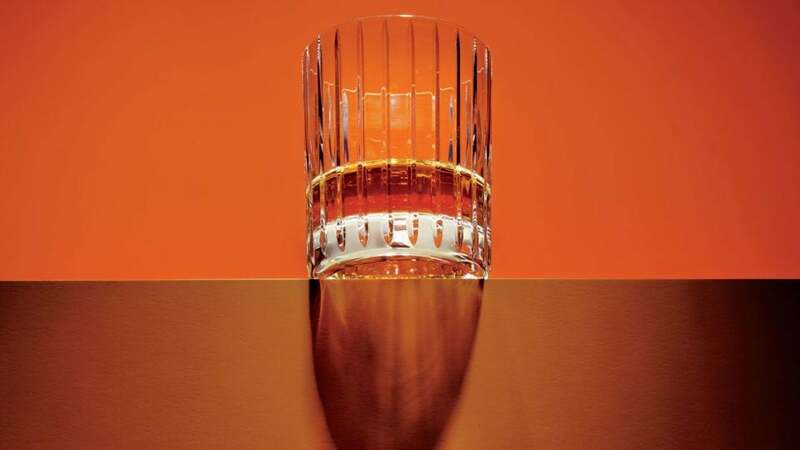 perfecting single malts crafted using water from magic (and secret!) springs, tweed-clad fellows with minimal nose hair and lasses with twinkling eyes drinking glass after glass of single malt whisky, and there’s you even, just having holed out your second on the 18th at the Old Course for a round of 61, and standing your witty local caddie to three or five glasses of single malt. Now, here is some sad news: It is impossible to see Scotland from North America. More to the point, single malts are inarguably magnificent, and the people who market them earn their sterling—but are single malts so delightful that the Scots drink them as their go-to? Or does pecuniary anxiety induce our Scottish friends to opt for more reasonably priced blends? Only by mining Big Data (I sent an e-mail to the Scotch Whisky Association) and conducting soft-nosed qualitative research (I rang up a few friends who are both serious golfers and professionals) would the truth be revealed. And here it is: In 2017, Scotland’s distilleries exported 122 million bottles of single malt, and 15 million bottles stayed in the UK. In the same year, 965 million bottles of blended whisky were exported, and 71 million were cleared for sale in the UK. You can quibble over percentages, but professionals know volume matters. The Scots I spoke to are professionals, and not without means—all are members of legendary clubs—and when they and their golf buddies drink whisky, it is typically gin. Yes, it turns out that at least the golfers I know in Scotland don’t drink much whisky at all, with one notable exception. I am told by fellow professionals that on a cold wet day, nothing will set you quite as right as a Whisky Mac, a combination of ginger wine or ginger liqueur and blended whisky. One friend said he prefers single malt neat whenever someone else is buying. Barman! A Whisky Mac and three glasses, please! 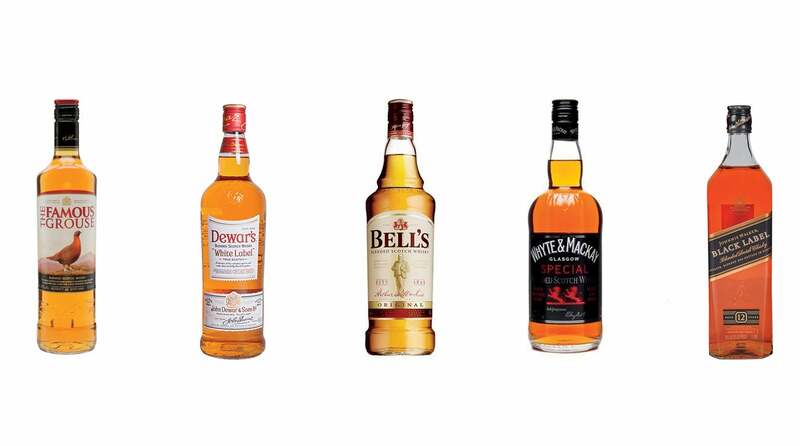 From left to right: The Famous Grouse; Dewar's; Bell's; Whyte & Mackay; Johnnie Walker. Here’s a quick one regarding the mystique of single malts. Along with a film crew, I was once taken to see a secret spring that was the source of water used in making a famous single malt. We were forbidden from filming the secret spring, because the pooled water was glazed with neon-green algae, much like the water inhabited by my pet goldfish, John Whaley. I tasted the water and did not die, and the single malt made with it is superb. The moral: Fill your goldfish bowl with whisky. Scots ask for their blended whisky by name and are served it neat (because ice makes it difficult to see if they are getting a full pour!) along with a small pitcher of water they use to cut to taste. These are the go-tos: (1) The Famous Grouse, aka The Low Flying Bird It’s the top selling blend in Scotland. (2) Dewar’s, aka The Drinking Man’s Scotch Best seller in the U.S., top five in the world. (3) Bell’s, aka Afore Ye Go Top mover in the U.K. overall. (4) Whyte & Mackay, aka Pride of Glasgow Related to Bones, according to 23andMe. (5) Johnnie Walker, aka Johnnie Walker Most widely distributed whisky on the planet.